Rose Cottage by the Bay. District, on Long Island’s North Fork, New York. 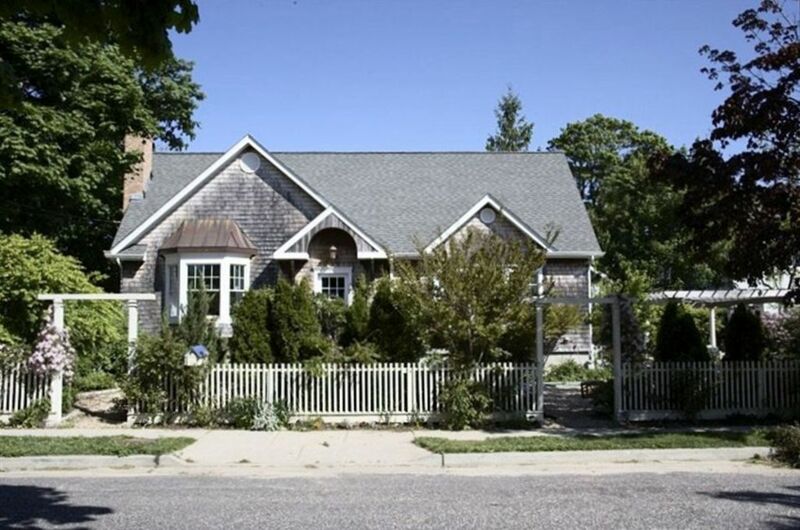 “Rose Cottage” is within the Greenport Village Historic District with water views of Sterling Harbour’s busy mooring field of classic to modern sailboats, and power. Fish as close as the Village dingy dock, two doors away: rent a boat, or slip, or launch your own, within a local clam’s throw. Bathe in and eat from some of Long Island’s (or the world’s) most pristine water quality maritime environments. Greenport Village is the gem of Long Island’s few active seaside villages: off the beaten path yet easily accessible from New York City by the LIRR, Hampton Jitney or car, or from Boston by car or Amtrak and the New London-Orient Ferry. Rose Cottage is an easy stroll from the Village Center and its restaurants, cafes, boutiques, gourmet shops, many art galleries and antique shops, banks (ATMs), bookstore, hardware and marine supplies, farm stand and supermarket. Greenport Eating is a pleasure from picnics at the many beaches, or harbour front Mitchell Park, with its Carousel and live entertainment, to waterfront clam bars, diner, cheese emporium, and tea shop, and of course more formal fine dining with top chefs and local food. Day Trips might include the quaint Orient Village, Sag Harbour, Orient Ferry roundtrip, the ‘Peconic Star’ to Block Island, Nature Conservancy's Mashomeck Preserves, Audobon Society’s birding and Town’s trails and woods, walk on the Shelter Island Ferry and stroll among the gingerbread houses and restaurants of the ‘Heights’. Greenport village is in the heart of the award winning North Shore Wine Country, with tasting rooms and live entertainment. Green Farm Stands all the time and Saturday morning tag sales and flea markets. All surrounded by the sea. “Rose Cottage” is beautifully furnished and styled by its owner, the former decorating editor of a national magazine, with an open floor plan, spacious rooms, gourmet kitchen: very light, and very airy. A two story Cape, two bedrooms (one queen, one double) and full bath upstairs, main floor master bedroom/front parlor with queen sofa couch and full bath (sleeps 4) kitchen dining room with half bath, large sun filled living room, couch sized reading bay window, and fireplace for cozy fall and winter evenings, “Rose Cottage” is surrounded by beautiful gardens, ideal for outdoor entertainment, fountains, mini ponds, and a pergola. Other amenities include washer/dryer, dishwasher, central air and heat, fireplace, cable TVs, internet access, personal chef available for shopping, cooking, small dinner parties, lunches, picnics. Great location first of all, walking to Greenport, close to the water and minutes away from everything we wanted to do. Lots of place to relax-inside and out. Very eclectic collector of all types of interesting art and "stuff"-boats and buddhas everywhere. Very zen-would definitely be back. We were able to check in early and there was even a bottle of wine waiting for us! Very nice hosts! What an adorable home! 3 of my college girlfriends and I stayed the weekend at this wonderful home just a short walking distance from town and the water. Perfect location and very spacious! My aunt and I spent fourth of July week (June 29-July 6) in Greenport, at the lovely Rose Cottage by the Bay. We thoroughly and absolutely adored the cottage--everything from the shabby-chic decor and the homey feel, to the proximity to 69 steps beach and town with so many dining and shopping options. The home was extremely clean, and I throughly enjoyed the outdoor space as well, under the pergola near the zen garden and fountain. The giant white couch in the living room was extremely comfy! Christine was kind and extremely helpful. We truly felt at home and settled in quickly, and felt welcome in town by all the local shopkeepers. Some of our favorite spots were Crazy Beans (affordable diner yet quality breakfast and top notch coffee) and Bruce and Sons for brunch--we went twice (reservations required! ); the Olive Branch (top notch Mediterranean); American Beech for cocktails and dinner, the tea house/salon (iced and hot tea!) and all the boutiques! We would highly recommend and love to return to the quaint town of Greenport. It was more like staying at your posh Aunts house than renting a house. You really feel at home and welcome in this cottage. Great town, Fabulous Cottage overall an excellent time in Greenport. We spent Memorial Day weekend in this beautifully decorated home, which provided us a backdrop for plenty of seafood dinners and rainy game nights after exploring wineries all day! We were greeted with music upon entering the home and a bottle of bubbly from Sparkling Pointe winery. Nice touch! We all especially loved your beautiful bay window looking out into the garden with the marina down the street. Just enough space for the four of us and hope to return in better weather to enjoy eating out under the pergola! One of the very best in our 40+ years of vacation rentals. Interior of the home is spotless, very well-equipped, tastefully decorated, and comfortable. The exterior is a wonder to behold, with fascinating statuary throughout and many attractive flowers and shrubs. The little town of Greenport is quiet, has some good restaurants, and the IGA has just about everything one needs. The owner and her son were very congenial and concerned for our comfort. We would not hesitate to return to the Rose Cottage. Thank you,please come visit again. Visit the North Fork Vineyards.